The cherry laurel is a popular ornamental tree and shrub grown in home landscapes. Cherry laurel trees reach a height of up to 25 feet tall, while the shrub variety reaches a height of up to 18 feet if not controlled with pruning. 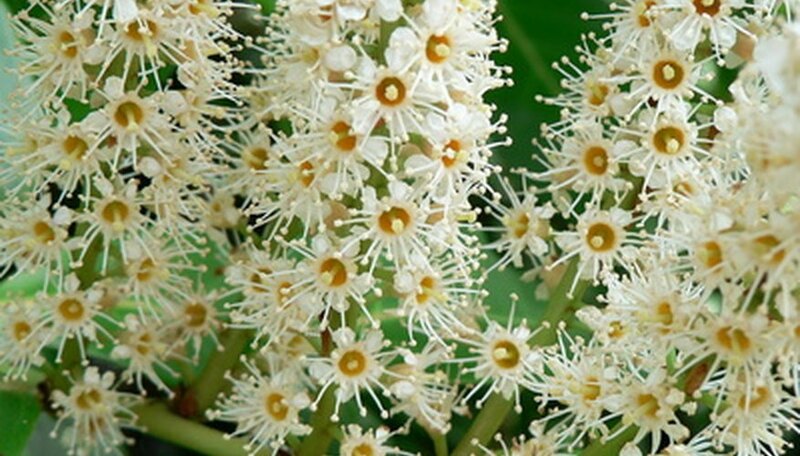 The plant has evergreen foliage and produces fragrant white flowers that turn into clusters of dark-colored berries that are poisonous to animals and humans. Cherry laurels grow best when planted in well-draining soil that has full to part sunlight. Water the cherry laurel tree or shrub generously one to two days before digging it up. This will plump the root system to strengthen it for the move. Select a new planting location that offers the same soil and sunlight conditions as the cherry laurel is currently growing in. Note the direction it is facing, as you will want to plant it in the new location facing the same direction. Remove the root ball from the ground by digging around the tree or shrub at a depth and width 20 times the diameter of the trunk. The more root structure included with the transplant, the better the chance of survival in the new planting location. Remove the cherry laurel from the ground and gently place it on a tarp. Wrap the tarp around the root ball, and move the tree or shrub to the new planting location. Dig a hole in the new location that is twice the size of the root ball and the same depth. Add a layer of organic compost to the hole and set the cherry laurel on top, making sure it is standing straight and facing the same direction as in the previous location. Fill soil around the root ball and gently pack it in place. Water the tree or shrub generously after planting to stimulate root growth. Continue to water it ever two weeks to keep the soil moist during the first growing season. Apply a 3- to 4-inch layer of wood chips for mulch around the cherry laurel, leaving a 3-inch gap between the trunk of the tree or shrub and the start of the wood chips. This will assist with moisture retention and prevent weed growth.